The ThinkStation D30, built for extreme performance and reliability when you need it the most. Coming equipped with Intel Xeon E5-2600 V2 series processors this workstation bolsters a performance boost of over 30% compared to it's predecessor. With 16 onboard DDR3 ECC DIMM slots this Workstation Powerhouse can make use of up to 512GB RAM. High speed video and multi monitor configurations are support by a variety of nVidia Quadro and AMD Pro Profesisonal Graphics cards. The Lenovo D30 is masterfully engineered to not only put out incredible performance, but to put out minimum noise and heat during operation. The tool-less access chassis is jam packed of features ranging from 6 PCIe slots to a plethora of I/O options. 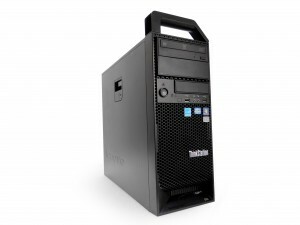 This ThinkStation powerhouse excels in creative environments such as CAD, CAE, CAM, DCC, Video Creation/Editing and Pharma/biotech research and is renowned for it's incredible reliability and adaptability. Bargain Hardware are the specialists in refurbished high-end workstations. Configure your Lenovo D30 using our Configure-To- Order system. Alternatively, if you would like to communicate with a member of our team, do not hesitate to open up live chat or give us a call.